The Mercedes-Benz W123 cars were produced from 1976 through 1986. The W123 models surpassed their predecessor, the W114 "slash-8" models, as the most successful Mercedes, selling over 2, 5 million cars, before being replaced by the W124 after 1985. 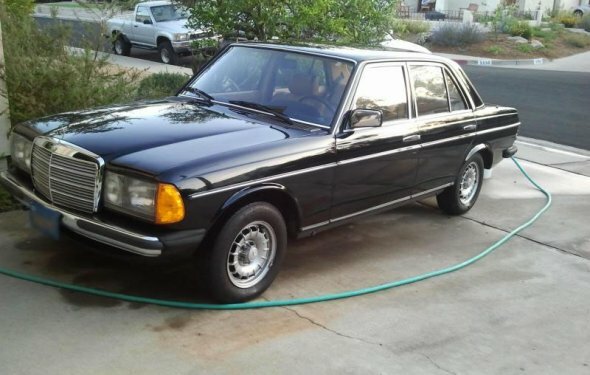 Also, the additional, smaller range of Mercedes-Benz W201 models was introduced in 1982. The W123 was the first Mercedes to have a factory-offered station wagon version designated as T-model, as earlier models were converted to station wagons, and long-wheelbase ambulances and hearses only by private companies. The W123 300 TD turbodiesel was one of the first turbodiesel cars on the European market. Because of the peculiar power band, the turbodiesel cars were only available with automatic transmission. Long wheel base models of the 250 and 240D were also available, with 7 seats, intended primarily for use as taxi cabs. Other innovations that its predecessor lacked, included ABS (Not available on Diesel models), a retractable steering column, self-levelling suspension (station wagon only), a safety dashboard and airbag for driver (after 1982/09). The 3-litre diesel engine was actually a 5-cylinder derivate of the 2.4 litre engine from the 240 D.
Available options included leather upholstery, wooden linings, 5-speed manual transmission (European market only), 4-speed automatic transmission, 4-speed manual transmission, rear-facing extra seats (station wagon only), Standheizung, airconditioning, automatic airconditioning, power windows (front and rear), headlamp wipers (European market only), Tempomat (cruise control), power steering (standard after 1982/08), seat heating, CO converter (available from 1984). Power assisted braking was standard on all W123's.